Is stress controlling your life? If so, you’re not alone. A Gallup Poll conducted in December of 2017 found that as many as 44% of people today reported feeling stress often during their daily lives. Stress may be the result of your facing too many demands every day or a need to shoulder a humongous workload. A worry about making ends meet or how to take care of your family causes lots of people stress. Stress may be making you feel as if you are constantly being attacked. However, you can relieve stress to prevent it from controlling your life. Stress in your life is all too often perceived by you to be a threat. The problem of that is the perception of being threatened causes your hypothalamus to set off an alarm system within your body. This alarm system may stimulate your adrenal glands to set off a surge of cortisol and adrenaline hormones. Greater amounts of adrenaline may elevate your blood pressure and increase your heart rate. Both of these can be a health threat for you. The cortisol increase may set off an alarm system that could communicate with your brain’s region that controls mood and fear. Feeling fearful can also be a threat to your health. All of these factors add up to stress being detrimental to your well-being. 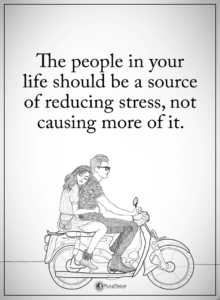 For that reason, you simply must decrease the effects of your stress. In just 15 minutes, any of the following practical ways to relieve stress will help you to avoid these threats to your health. Meditation is one of the best ways to relieve stress. You can control your stress by practicing meditation just 10 minutes a day. By increasing your capacity for relaxation with meditation, you can not only improve your cardiovascular health, but you can also decrease any anxiety you may be feeling. When your body is faced with a sudden threat or stress, it responds with an adrenaline rush known as a “fight or flight” response. Up goes your blood pressure and pulse rate. In addition, you breathe faster and an increased amount of blood flows to your muscles. Meditation instills a deep relaxation state in your body and reverses your body’s reaction to the “fight or flight” response. It slows your breathing, lowers your pulse rate and blood pressure and your metabolism is decreased. This state of relaxation will relieve your stress. • Find a pleasant and quiet place to meditate. Repeat a sitlent word or phrase to yourself. The word or phrase should have meaning to you. Sit quietly with your eyes closed and good posture for about 10 to 20 minutes. Breathe in a natural and free way. • You should focus on the word or phrase. Any worries that burst into your mind should be either dismissed or ignored. • Before finishing, open your eyes and allow your thoughts to return to everyday reality. People have used massage to feel better for thousands of years. Any relaxation technique that has been around for so long must be one of the best ways to relieve stress. In 2007, the American Massage Therapy Association reported the results of a survey they conducted indicated that almost one quarter of American adults had at least one massage in 2006. With a large variety of as many as 80 therapy styles, you can certainly find the best style to suit your needs. In order for your therapist to know the massage style you will need, you should decide your reason for wanting a massage. If you want a massage to control your stress and provide relaxation, you should tell your therapist. The style can then be determined to decide on the best movements, pressures and techniques for the therapist to use. In addition, an overall feeling of wellness can be gotten from massages. According to Cathy Benninger, an assistant professor at Ohio State University Wexner Medical Center in Columbus, another option for a massage could be your giving yourself one using a tennis ball. She suggests you should, “Place the ball between your back and the wall. Lean into the ball, and hold gently pressure for up to 15 seconds. Then move the ball to another spot, and apply pressure”. Yoga may be one of the fun ways to relieve stress you could enjoy. All yoga styles have only one common goal — to join your mind and body. One way yoga may get you to relax is by its increasing your breath and body awareness. Yoga has also been found to be effective on a person’s mental health. It has been found to be a mood enhancer and an antidepressant as well. Being an antidepressant, it has been used to treat both anxiety and depression. At this time, we don’t know how yoga is able to reduce stress and anxiety. However, it does appear that yoga has an effect on the stress response and the nervous system. Many studies have shown that yoga lowers your heart rate, blood pressure and stress hormones including cortisol, the primary stress hormone. One study followed 24 women who saw themselves as being emotionally distressed. The women participated in a three month yoga program. At the end of the three months, their cortisol levels were significantly lower. Their levels of anxiety, stress, depression and fatigue were also lower. Besides learning yoga, they did learn that they can relieve stress while having fun. Exercise is one of the best ways to relieve stress. It may put physical stress on your body, but it does relieve mental stress. It has been found that regular exercise makes it less likely for a person to feel anxious than a person who doesn’t exercise. 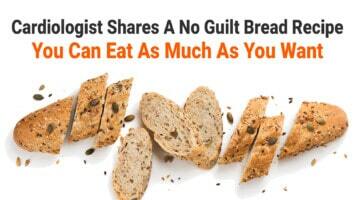 • Lower your body’s stress hormones including cortisol. • Make you feel more confident and give you a feeling of well-being. 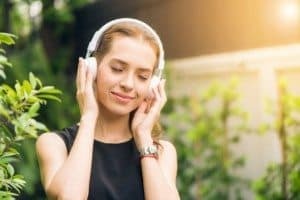 Listening to music is one of the most enjoyable ways to reduce your stress. You can relax by listening to soothing music as it lowers your anxiety, blood pressure and heart rate. Listening to sounds of nature such as a bubbling brook, the ocean or birds may be even more soothing. A great way to blow off steam is to listen to upbeat tunes and rock with them. You can also sing along with them loudly. Isn’t music a great way to relieve stress? Another great way to relieve stress is to simply laugh. Besides relieving your stress, laughing is good for your health. When you’re laughing, you can’t feel anxious. Lighten your load with a good belly laugh. • Produces oxygen to your organs and body. • Relaxes your muscles as it relieves your stress. • Improves your mood and immune system. • Lowers your cortisol, the body’s stress hormone. Since laughing can be the answer to how to relieve stress, discover ways to make yourself laugh. Watch a funny sitcom, read funny comics, read a book of jokes or just talk with a person who keeps you smiling. All of these things can relieve stress. Perhaps you would enjoy one of the above ways to reduce your stress. Meditation, massage, listening to music, exercise, and laughing can help you to “fight the flight” of stress.